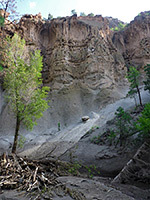 Frijoles Canyon Trail, also known as the Main Loop, is by far the most popular hike in Bandelier National Monument, and it can become rather crowded in summer. Although only 1.2 miles in length there is much to see along the way, and most people spend about one hour; the path encounters a large kiva, followed by the main ruin-site on the valley floor (Tyuonyi), then climbs slightly to the base of the cliffs on the north side of the canyon, where numerous cliff dwellings can be viewed close-up. These extend for a third of a mile and include several rooms that may be entered, via ladders. The loop is completed by crossing Frijoles Creek and returning through woodland on the far side, though an optional extension is to walk half a mile further upstream to Alcove House, a bigger dwelling in a high alcove. 20 views along the trail. The path starts from the visitor center, winds through shady groves close to the creek and emerges into more open terrain as the canyon becomes slightly wider. 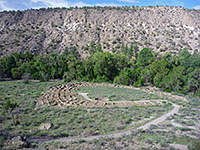 The first ruins are the partly rebuilt, 40-foot wide Big Kiva and then, in the middle of a grassy clearing, the two-storey Tyuonyi Pueblo, a circular arrangement of rooms around a central arena. Like the kiva, the village has been excavated and partially restored. This site once had over 400 rooms on two storeys, and was home to over 600 people, though its low profile today makes it hard to appreciate the scale; a better view is from above, at the end of the Tyuonyi Overlook Trail or along the Frijolito Loop Trail, both of which are on the canyon rim. 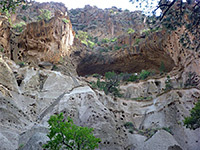 The Main Loop leads right through the pueblo then veers east, to the base of the cliffs, where all the cave dwellings are found, in two groups either side of a narrow ravine. All were built into the soft volcanic tuff cliffs, by enlarging natural cavities to form augmented alcoves known as cavates; there are hundreds of such rooms, often difficult to distinguish from natural, unused holes in the rock. Several of the dwellings may be entered, via ladders or steps, and again some restoration has been undertaken. There are few information plaques along the route - instead people are encouraged to buy a trail guide, price $1. The first group of ruins are centered on Talus House, a rebuilt dwelling at the base of the cliffs, below many cavates. 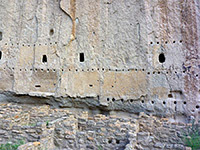 The other cave dwellings are collectively known as Long House, once a large structure with up to four storeys, but now all that remains are the cavates at the back, with many rows of post holes (vigas) showing where the front of the structure used to be. Some alcoves have painted walls and pictographs, one protected behind a plastic screen. Other locations have petroglyphs, all rather faint. 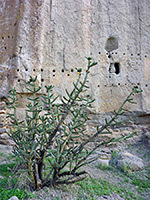 Tree cholla and datura are the most prominent plants hereabouts. Many more cliff houses are clearly visible in the canyon walls beyond the end of this section of the path, but off-trail hiking is not allowed. Instead, the loop crosses Frijoles Creek to the south side of the canyon and returns to the visitor center through cool, shady, wooded surroundings, a likely place to spot wildlife such as the unusual Abert's squirrel, which has distinctive, dark-edged pointed ears. The trip is completed via a bridge over the creek, leading to the parking lot. One other point of interest is the site of Ranch of the 10 Elders, the first homestead to be built in the canyon (in 1907), though nothing remains of the dwelling today. The lodge was removed in the 1930s, replaced by the current structure near the visitor center. Both were inhabited by early settlers Evelyn and George Frey, Evelyn living here until 1988. 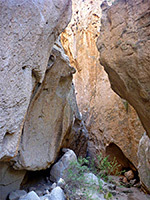 The continuation path to Alcove House (formerly known as Ceremonial Cave) forks west after the first crossing of Frijoles Creek, heading upstream through flood-damaged woodland of gambel oak and ponderosa pine, fording the creek three more times. 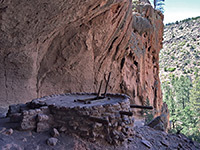 After a total walk of 1.4 miles from the visitor center, the trail arrives at the base of the ruin, which is situated in a large hollow in the upper cliffs, and includes a restored underground kiva; visitors may descend via a ladder through a small opening in the roof into the cool interior. The view from the platform is quite impressive. 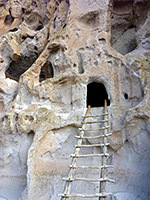 To reach the alcove requires climbing four steep ladders, totaling 140 feet, a task which some people may find difficult.